Over the last few years, the Systems & Networks group has built a creative, lively environment, drawing on public interest and motivated students alike. 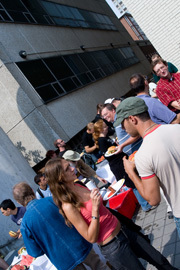 With 6 core faculty members and over 35 graduate students and numerous undergraduates, our group works on projects that cover a diverse range of experimental and theoretical research, including operating systems, network security, mobile code architectures, high-performance computing and wireless networking. These topics touch on issues important to the public at large who use computers everyday, and we are eager to take on the issues and challenges posed. The Systems group balances significant industry relationships with special opportunities for students to learn and develop their research. Find out more about our group on the following pages- we look forward to hearing from you!